Methenitis, G, Kaisers, M, & La Poutré, J.A. (2017). 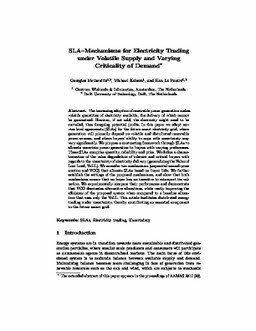 SLA mechanisms for electricity trading under volatile supply and varying criticality of demand. In Proc. of the Int. Workshop on Agent- Mediated Electronic Commerce and Trading Agents Design and Analysis (AMEC/TADA).